Extending east from Cape Crozier, the front of the Ross Ice Shelf is a 30 metre high vertical wall of ice. It’s a remarkable feature, especially when you realise that it’s fresh water, it’s floating, and about 90% of it is underwater. With an area of 487,000 square kilometres, the Ross Ice Shelf is the size of France and it’s pushing forwards at up to 3 metres a year. It’s hard, though, to do it justice in a photograph: it’s just a big cliff of white. James Clark Ross, who discovered it in 1841, sailed along it for 200 miles and couldn’t find a way through (it extends for 600 miles). He later wrote that it was like trying to sail through the White Cliffs of Dover. We had hoped to take the helicopters up and to land on the top (somewhere relatively crevasse-free), but the wind was too strong, blowing great sheets of spindrift off the top of the ice shelf. 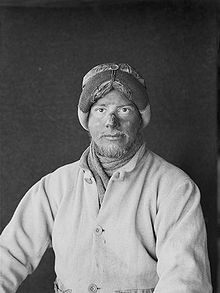 Apsley Cherry-Garrard during the Terra Nova Expedition. Cape Crozier was the destination of the Winter Journey undertaken by three members of Scott’s expedition to collect Emperor penguin eggs in the bitter cold of the dark Antarctic winter, later written up as The Worst Journey in the World by Apsley Cherry-Garrard. I can empathise with their experience – I’ve just realised that the tips of my thumbs have changed colour; I’ve got a touch of frostbite. I’ve spent too much time without my gloves. It’s hard to pick up rocks and use a handlens while wearing mitts. The pack ice hasn’t been very cooperative. We were in a large polynya off the Ross Ice Shelf, but to the west the pack is thick. It seems the ice has been pushed against the Victoria Land coast of the Ross Sea, all the way up to Cape Adare and even out to the Balleny Islands. The Ross Sea Gyre, a clockwise current, is responsible. The same thing happened in 1912, preventing Scott’s ship Terra Nova from reaching the Northern Party at Terra Nova Bay, and leaving the party stranded for the following winter. They survived the winter in truely horrendous conditions. We, though, sailed north and then northwest through the pack ice. After three days in the ice, we reached the clear waters of the Southern Ocean. After two weeks in the calm of the Ross Sea and its ice, we didn’t feel ready to face the 8 metre waves of the ocean. There were some interesting effects as we approached the pack edge. 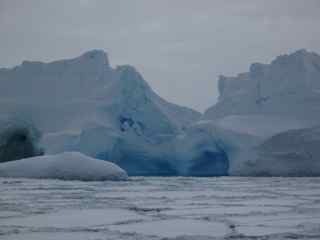 To the north, a dark water sky signalled the proximity of open water in that direction, while bright ice blink to the south came off the pack ice. The ocean swell was now beginning to reach us, and the pack ice which had been so solid for weeks, now rose and fell with the swell, and the ship began to roll. This morning it’s cold and foggy, snow has been falling on the decks, and waves breaking over the bow. 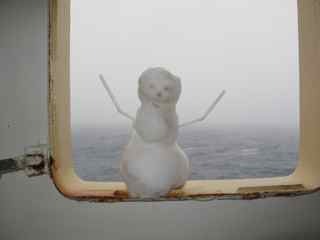 I came back from breakfast to find my cabin window wide open, large snow flakes falling on my laptop, and a little snowman sitting on the windowsill. The Alaskan has struck again. We’ll shortly hit the back of the low, so we’re expecting more of a roll this afternoon. The day after tomorrow we should reach landfall at Macquarie Island which sits right on the Pacific-Australian plate boundary. Tags: Antarctic, Captain Scott, expedition, explorers, geography, geology, history, Ice, islands, penguins. Bookmark the permalink.